The Hawaiian volcano that forced evacuations by spewing lava and noxious fumes into communities prompted a red alert on Tuesday, as the U.S. Geological Survey noted an ash cloud rising more than two miles into the sky. The U.S. Geological Survey upgraded the aviation warning for Kilauea from orange to red Tuesday afternoon, saying ash from the Halemaumau crater had been rising nearly continuously and in increased intensity. The ash cloud was observed as high as 12,000 feet above sea level and ashfall reported as far as 18 miles away. The USGS aviation code red designation means "major volcanic eruption is imminent, underway, or suspected with hazardous activity both on the ground and in the air." Geologists warn that if Kilauea blows its top, the volcano could hurl ash and boulders miles into the sky. The upgraded warning comes a week after the molten lava destroyed at least 26 homes in the Leilani Estates area on the Big Island. 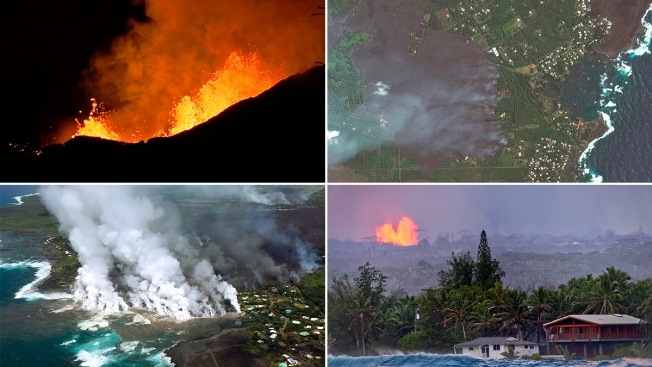 Thousands are still under evacuation orders as volcanic activity continues. Shocking images of lava spilling onto roads and 20 fissures expanding in the earth emerged as reports of toxic gas forced residents from their homes. "At any time, activity may become more explosive, increasing the intensity of ash production and producing ballistic projectiles near the vent," the USGS said in a statement. Geologists have warned that if Kilauea erupts, the volcano could hurl ash and boulders miles into the sky. But the Hawaiian Volcano Observatory said Tuesday that there is no evidence suggesting an earthquake that would generate a tsunami.